It is already mid-year and traditionally most of us attend conferences at this time of the year. 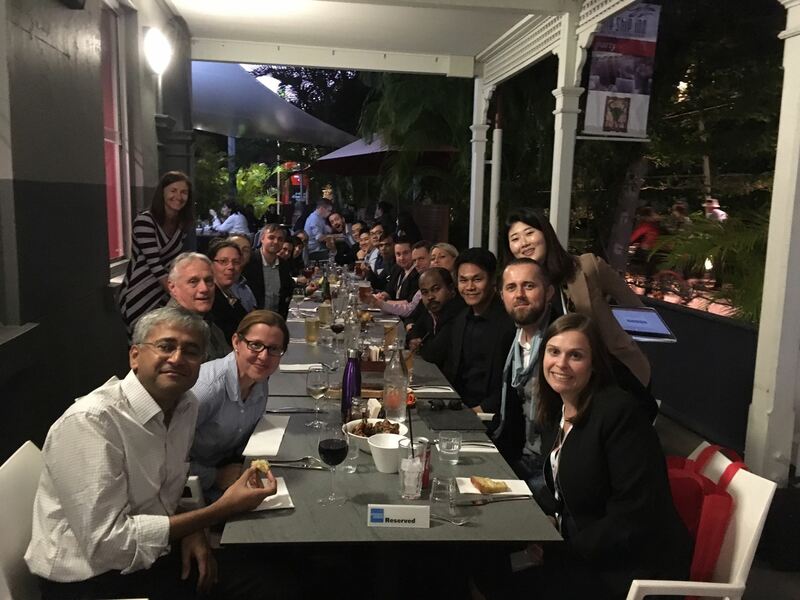 It has also been a tradition, in the last few years, to organise our ANZMAC mid-year doctoral colloquium, which was hosted by Griffith University in Brisbane this year. I would like to thank our doctoral colloquium chairs, Drs Denni Arli and Krzysztof Kubacki for their efforts, which have allowed us continue with our tradition of hosting this event. I would also like to thank all attendants, reviewers and keynote speakers (Profs. Sameer Deshpande (Leithbridge), Sharyn Rundle-Thiele (Griffith) and Mark Uncles (UNSW)) for their contribution. For more details on the DC please see below. This is also the time of the year when submissions to our annual ANZMAC conference are due. This year’s conference is hosted by RMIT and the conference chairs (Profs. Mike Reid, Linda Brennan, and Dr Linda Robinson) and the doctoral colloquium chairs (A/Prof. Ingo Karpen, Dr Bernardo Figueiredo) are very excited to be hosting this event. The conference chairs have been working very hard to create an exciting conference programme with a topical conference theme ‘Research with impact’, a strong line of keynote speakers (Profs. Darren Dahl (UBC), Eileen Fischer (York) and Linda Price (Oregon)) and a new paper submission format. I hope your paper preparation is well under way as papers are due on 30 June 2017. For more information about the conference and submission guidelines please see HERE. The life of academics is rapidly changing and ANZMAC’s goal is to develop ways in which we can support our community. Last year, as a result of our strategic review, one of the recommendations was to create a more vibrant ANZMAC community. As the first step towards achieving this goal, it is my pleasure to announce that ANZMAC invites nominations to establish our very own ANZMAC Special Interest Groups (SIGs). SIGs aim to facilitate and strengthen collaborations between our members by focussing on key research areas defined by our community. The purpose of SIGs is, in particular, to provide research leadership opportunities and a funding mechanism to support high-impact research publications. I would like to take this opportunity to thank A/Profs., Robert Aitken, Yelena Tsarenko and Prof. Ian Wilkinson for their work to get this initiative off the ground. The full terms of reference and the nomination form for SIGs can be found HERE, and for more information please contact A/Prof. Yelena Tsarenko, the ANZMAC SIG Chair. We look forward to receiving your applications. Thank you all for supporting our ANZMAC community and I look forward to interacting with you over the coming months. ANZMAC 2017 SUBMISSION DEADLINE – 30 JUNE! The deadline for Competitive Papers and Special Sessions is fast approaching – only 10 DAYS TO GO! The submission deadline is June 30. Don’t miss out on joining us in Melbourne for ANZMAC 2017 – Submit your paper HERE today. Click here for the Call for Papers and submission template. Click here for the Call for Special Sessions and submission template. Please note: 30 June is a firm deadline for paper submissions. The format for paper submissions has changed in 2017 and thus no extensions to the deadline will be given. Please check the Call for Papers and submission template prior to submitting your paper. Please note that submissions for the Doctoral Colloquium are due 1 August 2017 and submissions for the Poster Session are due 31 August 2017. 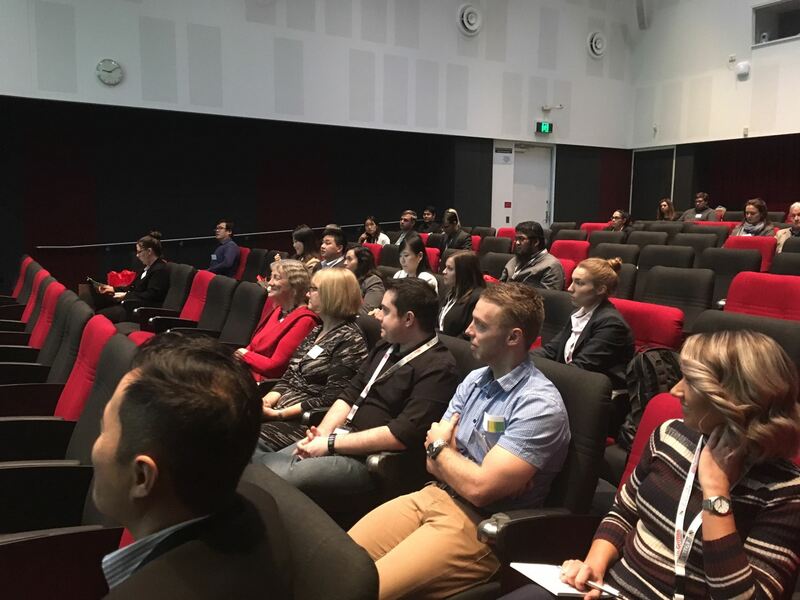 The 2017 ANZMAC Mid-Year Doctoral Colloquium (DC), co-chaired by Associate Professor Krzysztof Kubacki and Dr Denni Arli and hosted by the Griffith Business School, was held on June 23rd at Griffith University’s South Bank campus in Brisbane. The aim of the Mid-Year DC is to provide support to doctoral candidates and to create additional networking opportunities in a smaller setting throughout the year. Attendees from Australia, Canada, France and India had the opportunity to present their doctoral work-in-progress and receive feedback and mentoring from senior researchers from several universities in south-east Queensland. The event also featured keynotes by leading marketing scholars including Professor Mark Uncles (University of New South Wales), Professor Sharyn Rundle-Thiele (Griffith University), and Associate Professor Sameer Deshpande (University of Lethbridge, Canada) introducing attendees to the challenges of conducting research in partnership with non-academic organisations, and the benefits of building an academic career in Australia and overseas. The Colloquium was held in a friendly and collaborative atmosphere. A number of different research areas were covered, including among others social media consumption and well-being, pro-environmental behaviours of hotel guests, engagement in higher education, consumer behaviour in services and social marketing. 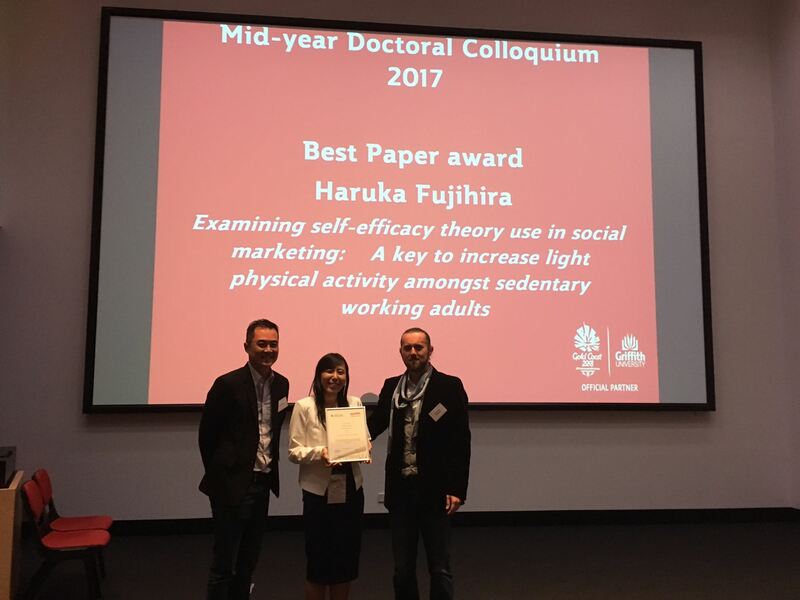 The winner of the 2017 ANZMAC Mid-Year Doctoral Colloquium Best Paper Award was Haruka Fujihira, for her paper entitled “Examining self-efficacy theory use in social marketing: A key to increase light physical activity amongst sedentary working adults”. Two runners-up included Luke Hawley from the University of the Sunshine Coast and Helen Cocco from IÉSEG School of Management in Lille, France. Submission Deadline: 5pm (EAST), 22nd July 2017. Students completing the requirements for their doctoral degree in the marketing discipline between 1st January 2016 and 30th June 2017 are invited to enter the annual ANZMAC Dissertation Award Competition. Graduates must have had their thesis passed by the university (though degrees may not have yet been conferred). Applicants must be enrolled at an ANZMAC Institutional Member university. Applicants must have the expressed support of their institution and only ONE submission per Institutional Member is permitted. To be an eligible Institutional member to apply for this award, the institution must have been an ANZMAC Institutional Members for two consecutive years (including the year that the award will be awarded in), i.e. Institutional Members of ANZMAC for 2016 and 2017. 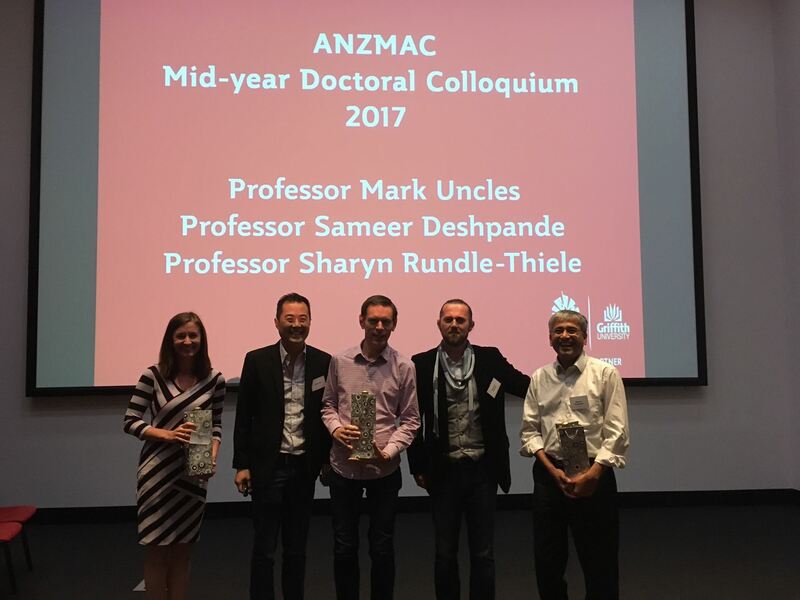 ANZMAC supports academic excellence for emerging scholars though a range of initiatives and is pleased to announce this award to recognise the quality of completed PhD dissertations of Institutional Member universities. The award is endowed by the University of New South Wales (UNSW) as a tribute to the significant contribution of Professor Roger Layton. Professor Layton is the first Professor of Marketing at UNSW, and a leading academic within Australasia who has demonstrated sustained and ongoing commitment to the development of new and emerging academics. Professor Layton is Emeritus Professor in the School of Marketing at UNSW. He is a Fellow of the Australian & New Zealand Marketing Academy. In 2012 he was honoured by a special issue of the Australasian Marketing Journal. Professor Layton has published widely and is the joint author of many scholarly books. His contribution to macromarketing has been recognised through the Charles Slater Memorial Award in 1990, 2008 and 2011; the 2010 Shelby D Hunt Award for the most frequently cited paper; and through the George Fisk best paper awards in 2006, 2007 and 2011. He most recently received the Robert W. Nason Award for significant and sustained contribution to the field of macromarketing at the 2013 meeting of the Macromarketing Society. In 1998, Professor Layton was made a member of the Order of Australia (AM) for his services to Marketing. The Award winner will be recognised at the 2017 ANZMAC dinner with an achievement plaque and a cheque for AUD $500.00. Applicants will be notified by 31st October 2017 regarding the status of their submission. The submission should describe the research questions/issues, propositions and/or formal hypotheses (if appropriate to the method), relevant literature, data, research and analytic methods, findings, limitations of the study, conclusions, the contributions of the study for theory and practice, and suggestions for future research. The literature background, design, methods, analysis and findings should be presented in enough detail and clarity to provide a theoretical grounding for the study and to allow the proper assessment of its methodology and findings. When printed, the submission must be no more than 30 double-spaced pages in 12-point type; this limit is inclusive of all pages (e.g., text, references, figures, tables, and appendices). The manuscript guidelines for the Australasian Marketing Journal should be used as a style guide. Submissions beyond the page limit or inconsistent with the style guidelines will not be sent out for review. Authors should submit their manuscripts and institutional letters of support electronically as email attachments (one for the letter and one for the submission) in MS Word to Professor Michael Polonsky the Awards sub-committee Chair Michael.Polonsky@Deakin.edu.au. The letter to the award co-chairs (see below) must be included in the email message itself. Please note that the single manuscript file must be complete (text, references, figures, tables) and sent as one file only. We cannot accept manuscript submissions sent as multiple file attachments or with incomplete information. Please do not mail hard copies. The accompanying email letter to the co-chairs should include all of the following information: author’s name, telephone number, e-mail address, the school awarding the degree, supervisors and affiliations, the date the dissertation was passed by the Institution’s HDR committee, and the candidate’s current position. 2015, Yanwei (Wayne) Zhang (University of Southern California, USC Marshall School of Business, USA): "Understanding Virality of YouTube Video Ads: Dynamics and Drivers"
This year saw the launch of the inaugural ANZMAC Strategy Challenge, where teams of researchers from different universities pitted their knowledge and understanding of marketing strategy against each other. The ANZMAC Strategy Challenge took place over three months, using the ‘Business Strategy Game’ online strategy simulation. Teams were responsible for developing and implementing a strategy to produce athletic shoes, using real-world data. In this first edition of the ANZMAC Strategy Challenge, five universities, including the University of New South Wales, University of Auckland, AIS Global, Otago University and Curtin University competed for the title. Across the three months, competition amongst the teams was fierce but there was only ever going to be one winner. 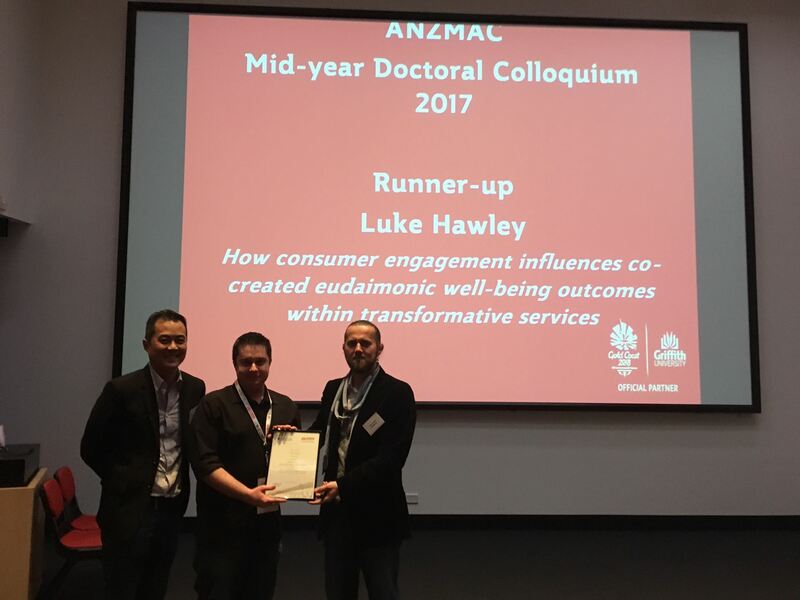 As such, the team from the University of New South Wales, comprising Jake An, Vicky Andonopoulos and Jonas Heller took the honours and were crowned 2017 ANZMAC Strategy Champions. Second place was taken by Jamal Abarashi, Rob Aitken, Sergio Biggeman, David Bishop, Sabeehuddin Hasan and Masoud Karami from University of Otago. In third place were Michael Baird, Robin Domondon, Joshu Easton-Gomez and Graham Ferguson from Curtin University. The performances by all teams throughout the competition were world-class, with UNSW making the Global Top 20 for a number of variables including overall score and stock price. When asked about her experience in the challenge, UNSW PhD student Vicki Andonopoulos said the game “is a fantastic representation of a real business environment and managerial process”, adding that it was also “highly beneficial in terms of fostering team building skills….and the 'competition-like' concept of the game really pushed the group to work with a goal in mind.” The winning team will receive their awards at the ANZMAC conference in Melbourne later in the year. In 2018, the ANZMAC Strategy Challenge will be making a comeback, with bigger prizes on offer and the chance to win the title as Australasia’s ultimate strategy guru. Will your university be in the running? Thank you to challenge organisers Gavin Northey and Rebecca Dolan of University of Auckland Business School. Asia Pacific Journal of Marketing & Logistics www.emeraldinsight.com/apjml.htm and Marketing Intelligence & Planning www.emeraldinsight.com have both in the last few days been included into the SSCI. This takes the list of Emerald marketing journals in SSCI to seven and includes the recently acquired International Journal of Sports Marketing and Sponsorship www.emeraldinsight.com/ijsms.htm The remainder of the journals in the marketing collection are all included in the Emerging Sources Citation Index (the new service provided by Clarivate Analytics who run SSCI) and a number are currently under evaluation for SSCI. We hope for more good news shortly and this is of course good news for the community of researchers as it gives you more impact factor journals as outlets. The first impact factors for APJML and MIP will be released in 2018 and will be the 2017 impact factors. Coverage is retrospective from 2015. The Marketing Discipline Group at the University of Technology Sydney (UTS) is calling for expressions of interest from prospective PhD students. Candidates with strong academic records in business as well as related disciplines such as economics, psychology, mathematics or statistics are encouraged to apply. For more information please see: https://www.uts.edu.au/future-students/business/business-courses/postgraduate-research-phd/marketing-phd or contact Research.Business@uts.edu.au. Expression of interest closing date is 31 July for the Autumn session (January – June) of the following year.